Life is painting a picture, not doing a sum. – Oliver Wendell Holmes, Jr.
Now around midday the sun struggles to keep her chin above the horizon. The frost covered world joins the battle against darkness and bounces every photon from side to side. In a few hours the sun cannot keep up her eyelid anymore. The night shift belongs to the full moon, refreshed and with steady precision he mirrors her light back to our world. A brilliantly directed symphony that cheats darkness on the seasonal drawbacks of a 60°8’N latitude. 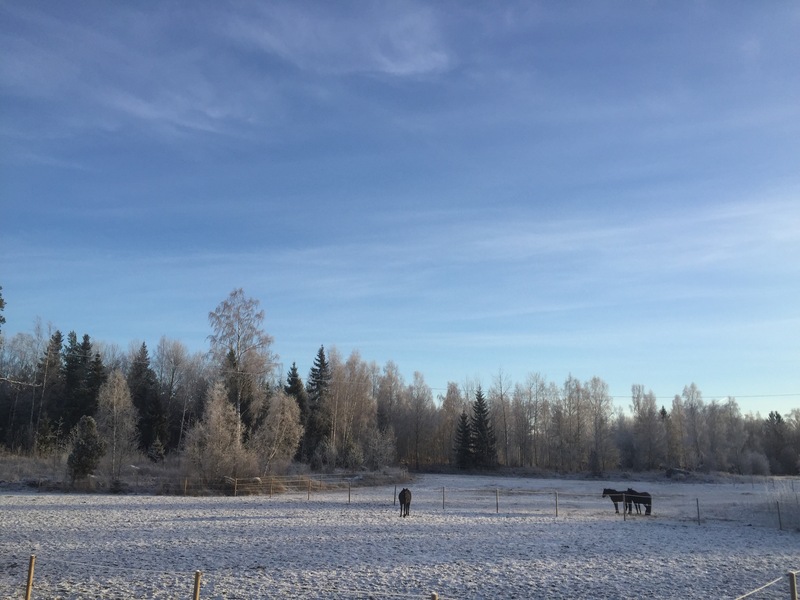 Our horses enjoys the tranquility created through cold clear skies and absence of wind. All soundwaves are attenuated by snow and frost; creating a feeling of safety to all prey animals. A cold silent “now” enhances the soft touch of sunbeams against the horses natural winter coat. 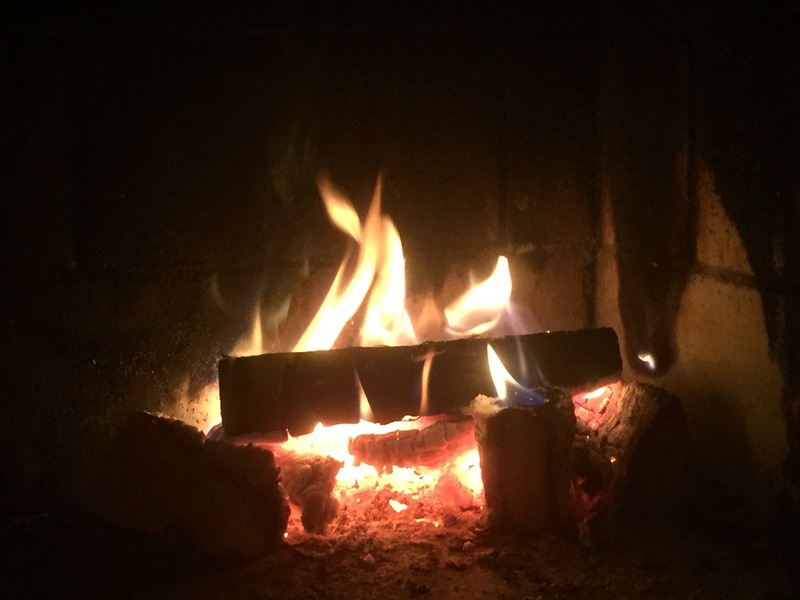 A good end to an eventful year and promises of a good new year in the making. 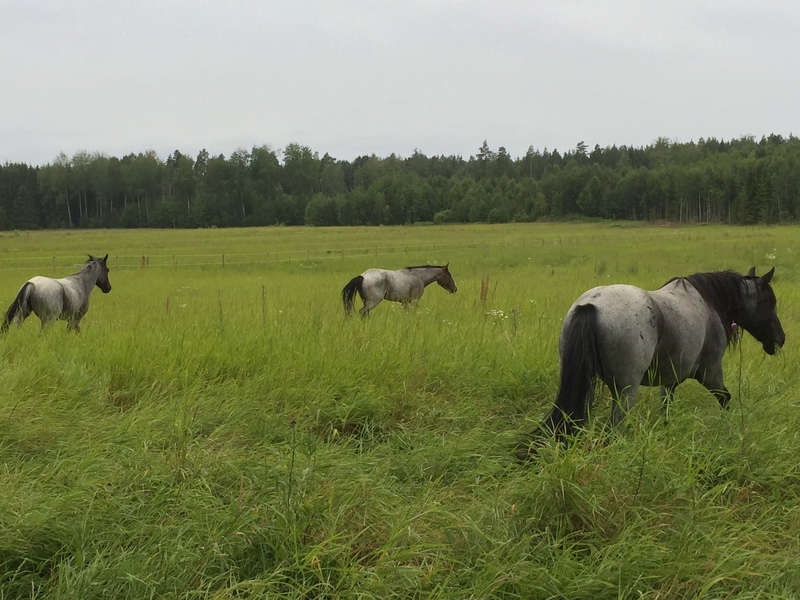 Just over two weeks has passed since our horses headed for the winter pasture, after spending the summer on the fenced part of the meadows just across the dirt road passing thru our farm. They have settled in nicely in their new quarters, built especially for them. 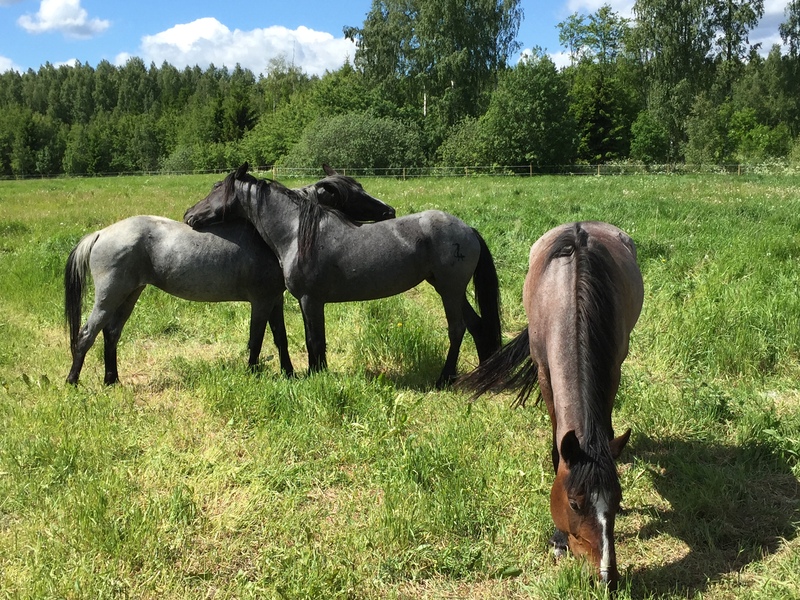 Since the day we settled down at our new farm in mid-June our three Nokota mares have roamed a fenced semi-vast pasture next to our hay field; enjoying the summer pretty much undisturbed. 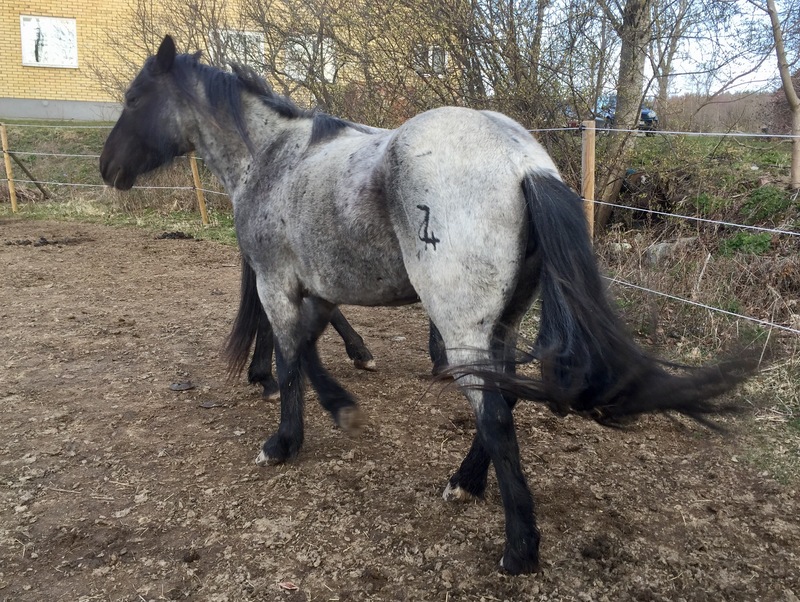 When the horses unsteadily stepped out of the two trailers, late in the evening after a long and tiresome but smooth transport across Sweden; they saw, felt and smelled the high and lush grassland around them and immediately gained balance and began grazing as they walked, trotted and cantered into the field as the last sunbeams curved around the edge of the horizon surrendering their last warmth. 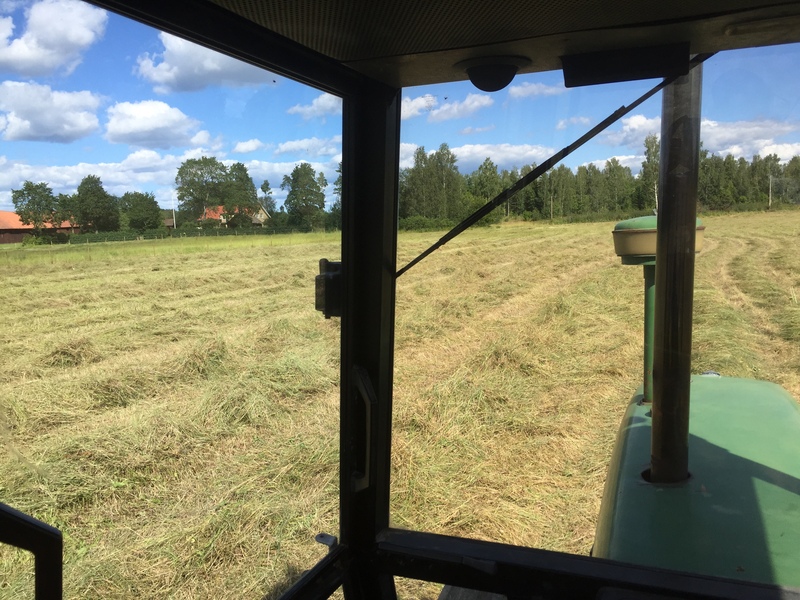 It was a liberating feeling for all of us after a long time of, if not hardships at least, the exhausting tasks it takes to relocate a farm family of six different species, Homo sapiens included, a distance of several hundred miles. 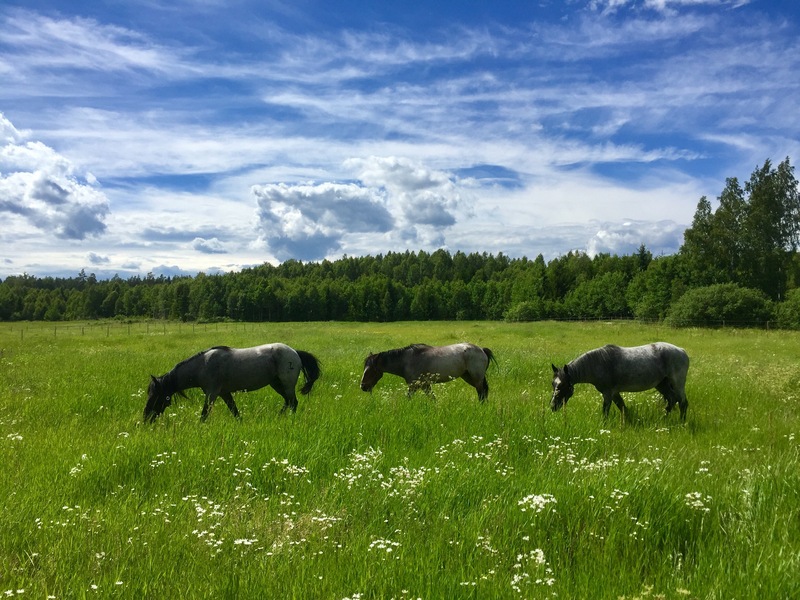 It was fascinating to learn how the horses’ behavior transformed; they returned to a more natural state, embracing clear elements of basic wild equine instincts. Their heartbeat seemed to slow down, movements became smooth and quiet yet targeted, as they hoofed new paths thru the tall grass; working their way like a band, Bluebell in the lead, the others following in some unspoken and unquestioned order of merit, spending nights under a bare northern sky shared by moose and roe deer, fox and raven; a beautifully starlit sky notwithstanding the sun barely hiding below the distant tree line, afar from unsettling light-polluted cities. 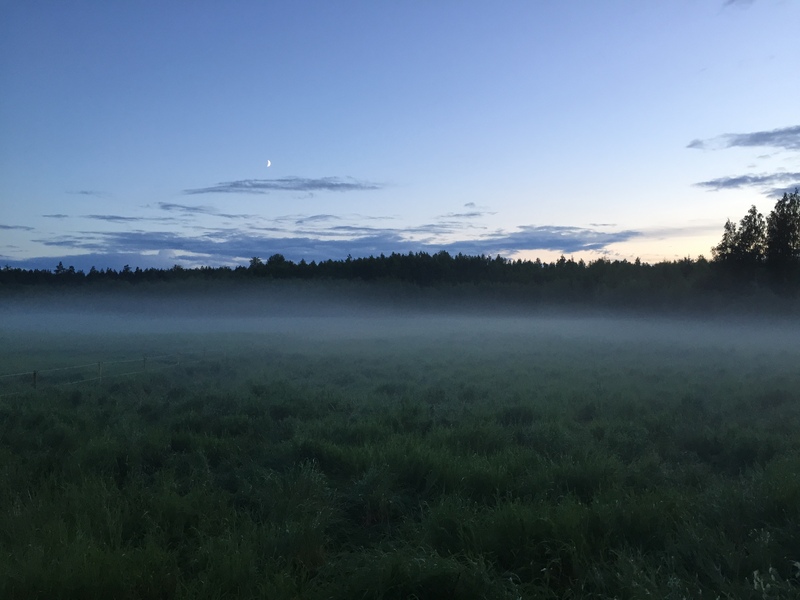 Dark and misty evenings in early September were special. As we came to the fence to check on them before night they approached us so silently; the smell of their breath and their body heat revealed their presence long before any sound or visual features was sensed. 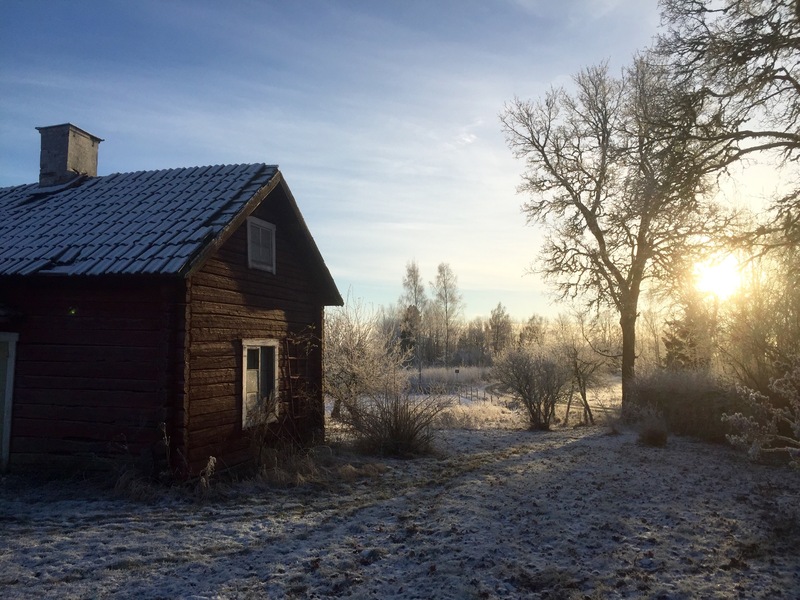 The winter pasture serves several purposes, but primarily because horses officially need a shelter to protect them from cold winds and wet grounds “during the season grass do not grow”. Unofficially the horses could not care less, buildings are not on top off these Nokota horses wish list; open prairieland is. 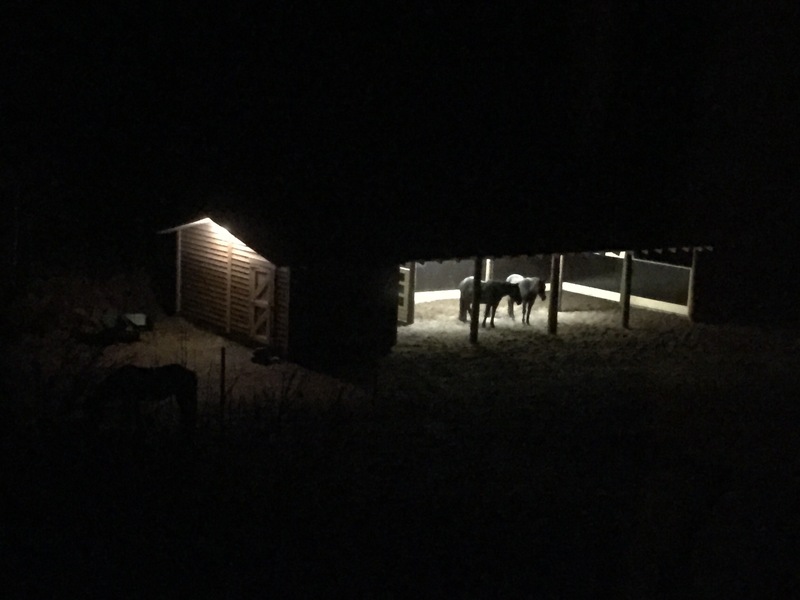 But even so, our horses have learnt from our last location that a nice open barn with soft dry bedding and a good roof and solid walls has its advantages, once a horse gets totally convinced it is safe. By time they do surrender most of their suspicions about this specific building for good and begin to spend more and more time under shelter, though they always choose their own moments as illogical as they may seem to human understanding. 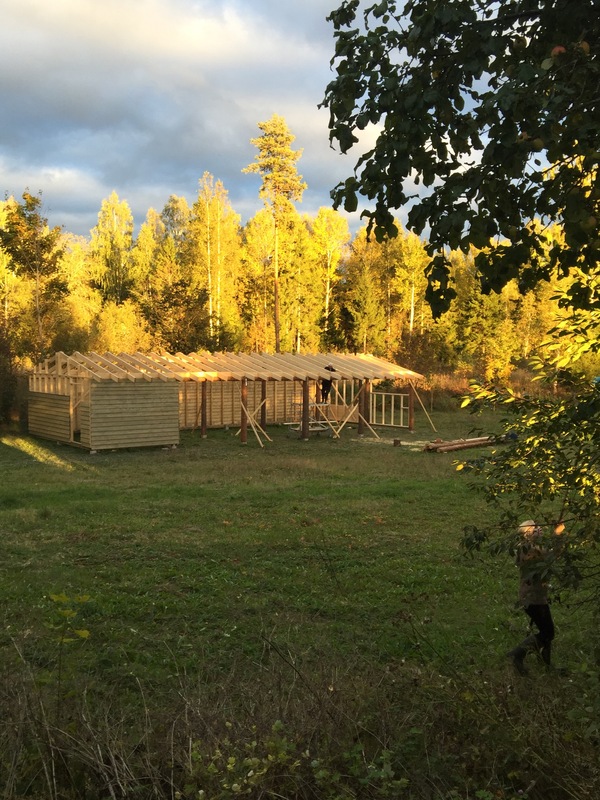 The last horse barn we built was intended as a traditional stable with box stalls, even if we never used it as such; from the day the Nokotas arrived in late 2011 it served as an open stable. 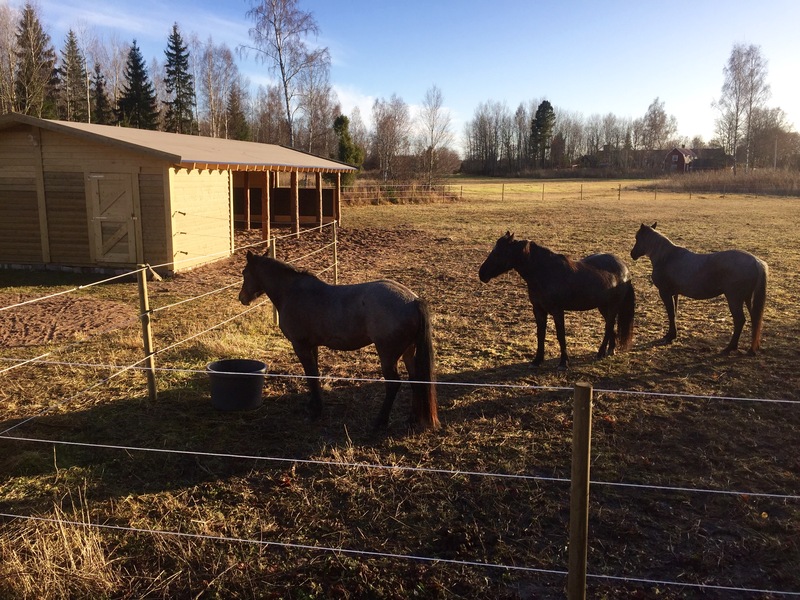 This time we designed and built an open horse shelter specifically to fit the needs of our horses. All in all it took three months to complete, during which time we also managed to harvest the hay as well as a few wheelbarrels of cherries and apples, along with doing various other chores that goes with overtaking a farmhouse originally built A.D. 1850, though thoroughly modernized in the early sixties. In spite of minor setbacks we now have 1 100 hard-pressed 20-pound bales of hay to get us thru the winter. 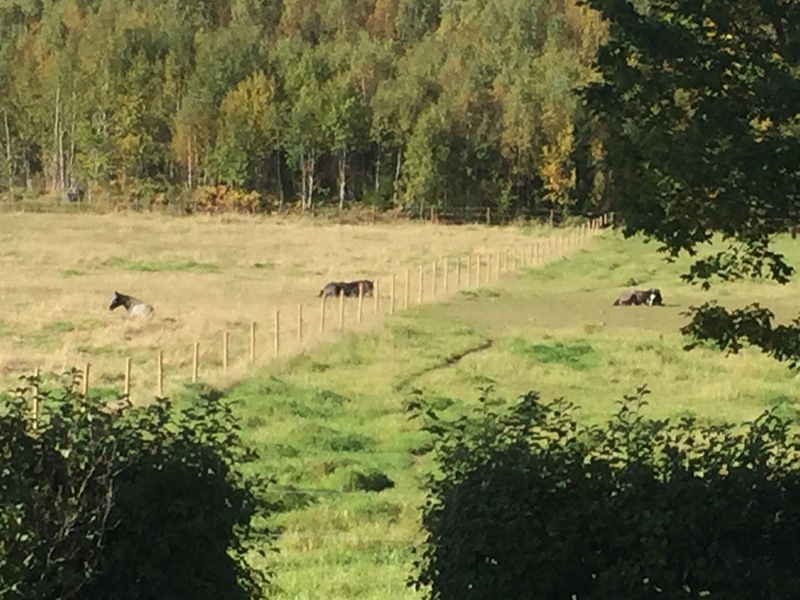 The autumn is here and three Nokota mares are resting on the sun baked meadow. 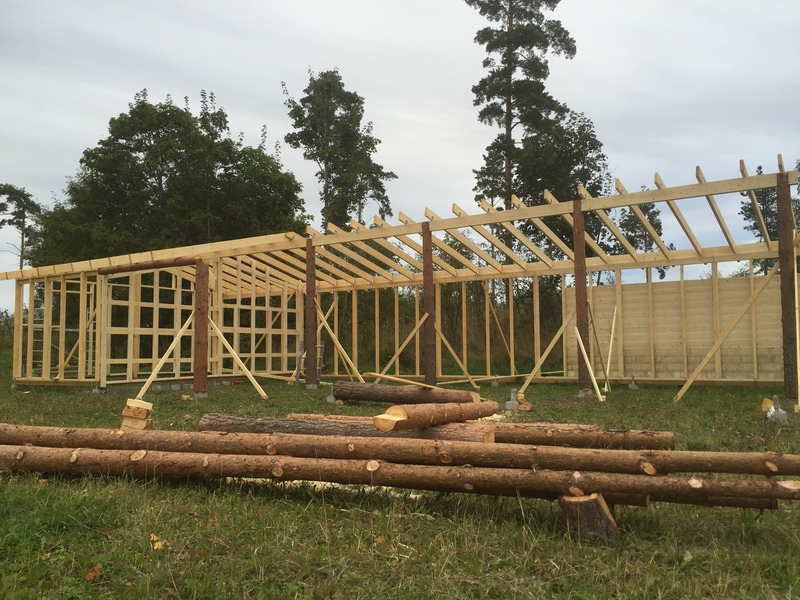 Soon our new horse barn will be ready and then it is time to move to the winter pasture.